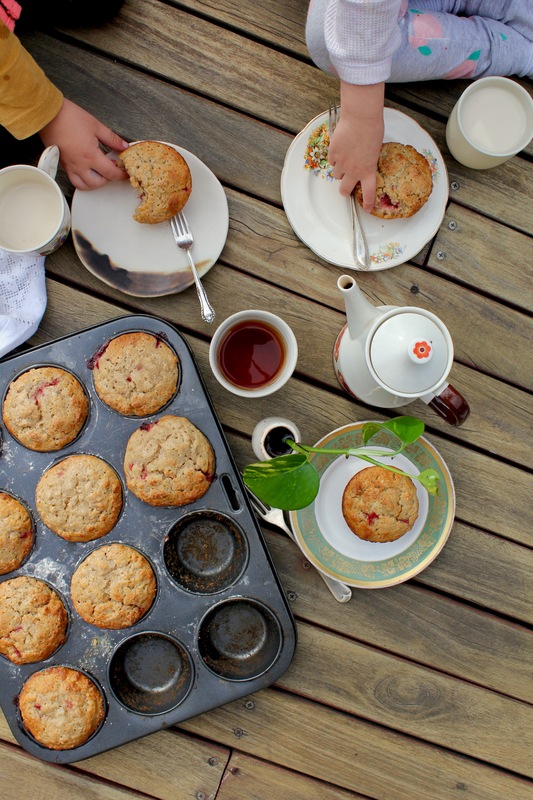 The day we made these Pear & Strawberry Muffins last week was unexpectedly lovely. The morning was the first really cold one of the year. Thick socks and hot cups of tea kind of cold. Frosty breath in the morning air, clear blue skies, thin yellow sunshine turning the autumn leaves still clinging onto tree branches all the shades of gold there are no names for. The kids woke up all grumpy, but banana pancakes did their job, and full bellies improved their mood no end. We spent the morning riding the bike through the streets of our neighbourhood, running around the wet grass of the park, eating the last of the season’s strawberries, and picking out Star Wars books from the library. Toasted cheese sandwiches for lunch, then gardening out on the terrace, the sun just warm enough to take off our jumpers and let the rays hit our skin. 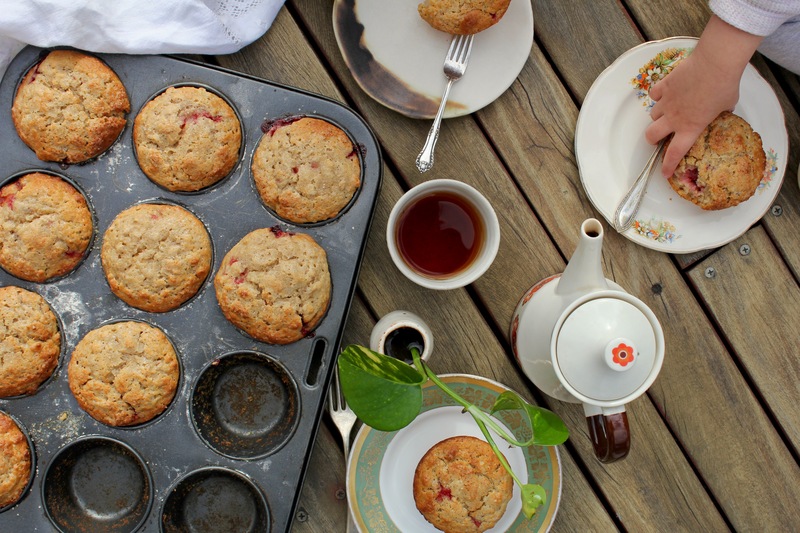 We had half a punnet of slightly-too-squishy strawberries left over and so on a whim W and I decided to make muffins for afternoon tea. While T was having his nap, we sifted and whisked and stirred and baked, me standing up, W sitting in her favourite spot sitting up on the kitchen bench, right in the thick of the action. 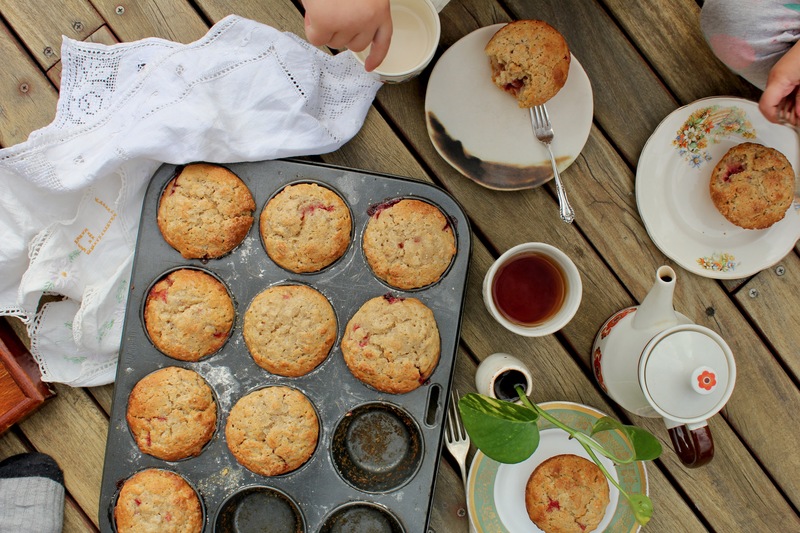 After T woke up, the kids and I made rose-scented tea, and took our hot-from-the-oven muffins outside, picnic-ing amongst our newly potted succulents and budding garlic, beneath a pale blue, cloud-streaked, afternoon sky. The scent of the muffins was too tempting for the kids to wait while I photographed, hence why the images below have small hands in them! 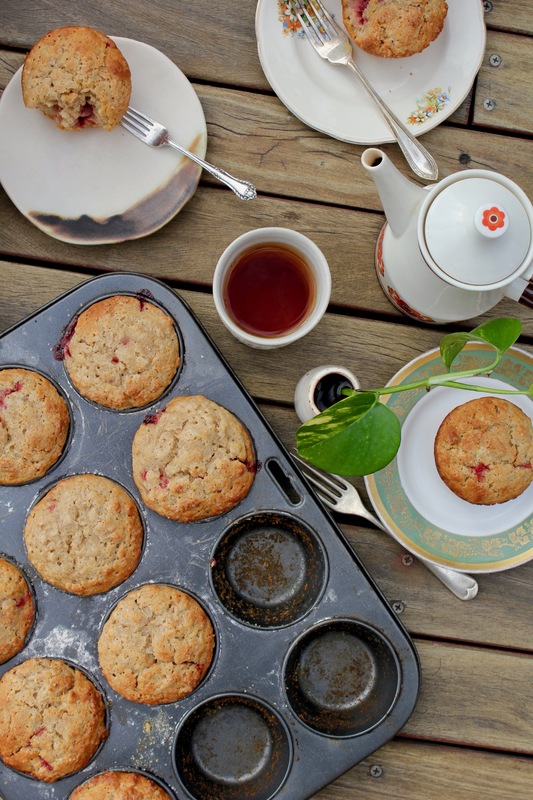 These Pear & Strawberry Muffins are slightly adapted from Sprouted Kitchen’s Pear & Hazelnut Muffins, ones that I’ve made several times over the years. Between the oats and the wholewheat flour on the one hand, and the yoghurt and pear on the other, they’re at once toothsome and light. Plus the strawberries hidden inside are the best kind of fruity surprise. Bake them until the tops are autumn-gold, and drops of strawberry juice are escaping down the sides. Preheat oven to 180°c/375°f. 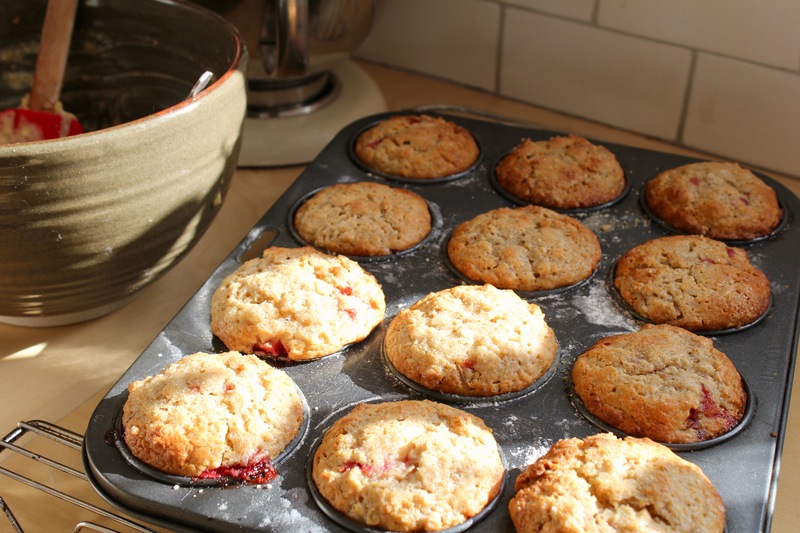 If you’re using muffins cases pop them into the muffin tin, otherwise butter and flour all twelve cups of a muffin tin. Set aside. In a small bowl combine the oats, both types of flour, the baking powder, cardamom, cinnamon, nutmeg and salt. In a larger bowl combine the cup of sugar together with the olive oil and vanilla extract. Add the eggs and whisk through, then stir in the yoghurt. Grate the pears, and stir through the wet ingredients. Remove the tops from strawberries, quarter, and set aside. Add the dried ingredients to the wet and mix until just combined. Spoon the batter into the muffin case, filling each cup halfway. 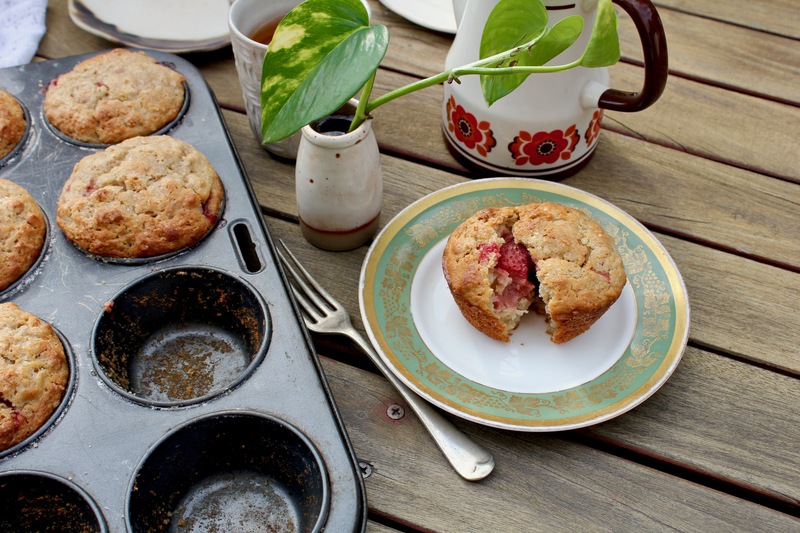 Add five of the strawberry quarters to each muffin, then top with an additional spoonful or two of the batter, until all the strawberries are covered up. Sprinkle the remaining tablespoon of sugar over the whole lot. Bake for 24 minutes, or until the muffin tops are domed and golden. Leave to cool in pan for approx. 10 minutes, then remove to a wire rack. I happened upon your blog accidentally. 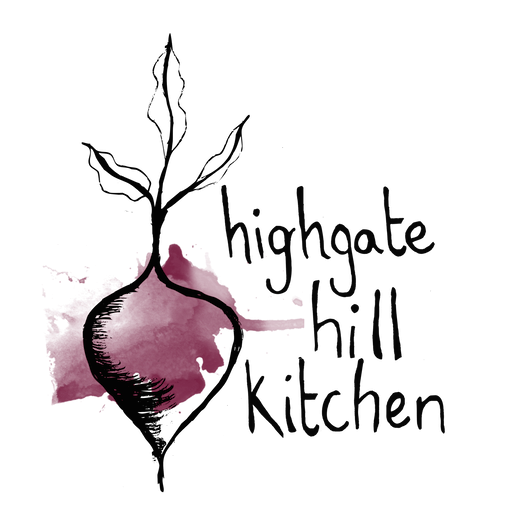 Your recipes look lovely, (photos too) but I actually followed your blog because I really enjoy your writing. I was a little startled at first reading this one as you welcomed fall, as I am on the other side of the world just welcoming spring, but of course the seasons are opposite. Thanks for sharing your world through your words (and food).